See your current localization effort and find out which languages to target next! 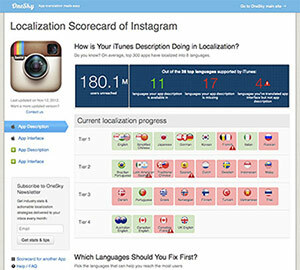 Please select your app and input your email address below to get the localization scorecard. Which countries are you missing? Top 10 countries that you shouldn't miss? Which languages to go first? © 2013 OneSky Inc. All rights reserved.